Hope you've had a wonderful holiday this week. One more holiday to go! 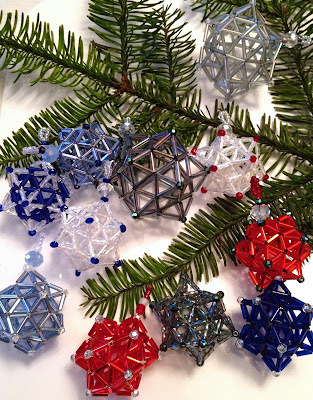 I love creating Christmas ornaments and this month I've had a great deal of fun building geometric shapes with bugle beads - icosidodecahedrahns to be precise. 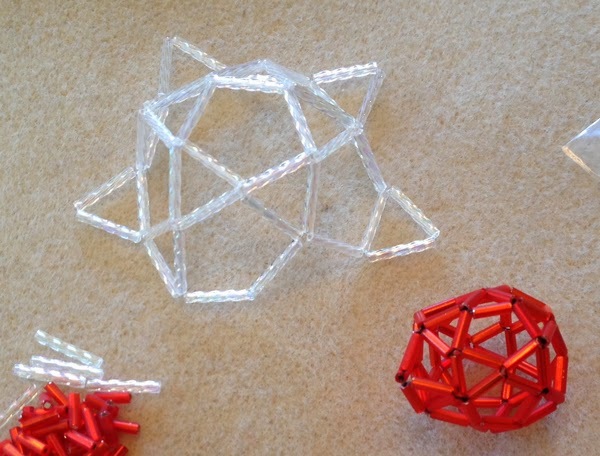 They're spheres made up of triangles and pentagons. Debby's design that she taught at the bead retreat used smaller bugle beads and had a 12mm bead in the center for stability, but I wanted to see what I could do working with some bugles from my stash without a central bead. Thought I'd share a peak at some of my experiments. Had to go buy some Fireline for these experiments - Superlon just wasn't going to work, between the bugles and the crystals. Simply too many sharp edges. Finished off an entire spool of the crystal, and most of a spool of smoke. Most of these were sent off as Christmas presents, but a couple stayed here at home (mostly the early, slightly misshapen attempts - my tree is the home for all my Misfits like the sad little red one at the bottom). Most of these were made with 6mm bugles. 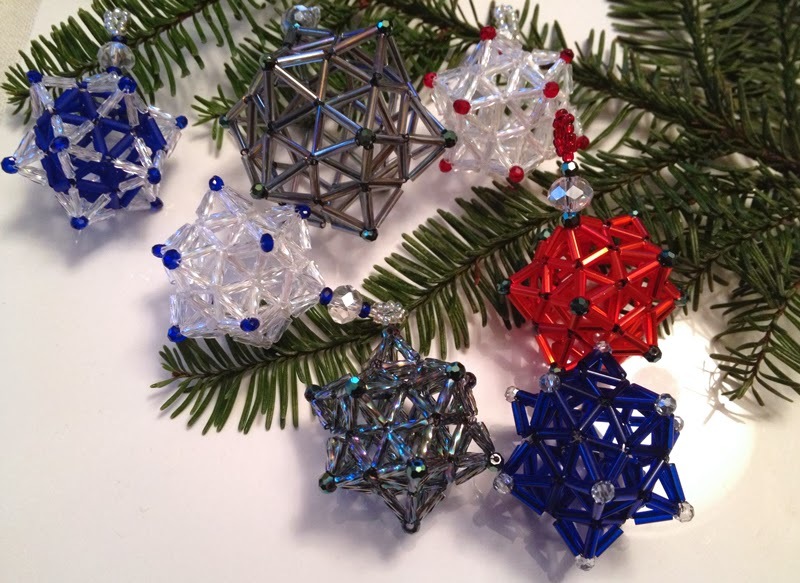 The two larger ornaments used transparent silver 8mm bugles - the color difference between the two is due to the thread, as they're both made with the same beads. 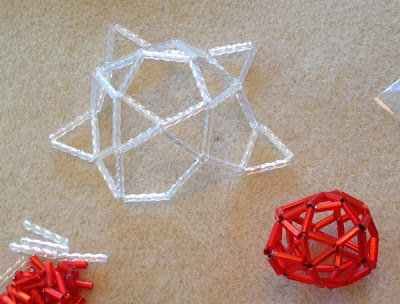 Then I decided to see if I could make the shape work (ie keep it from collapsing in on itself) with 12mm transparent crystal bugles. 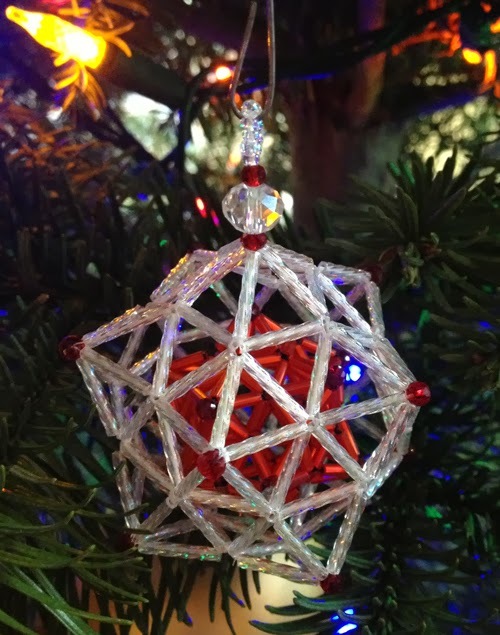 About halfway through the interior sphere with the crystal bugles, I realized its interior was large enough for one of my smaller baubles to fit inside. 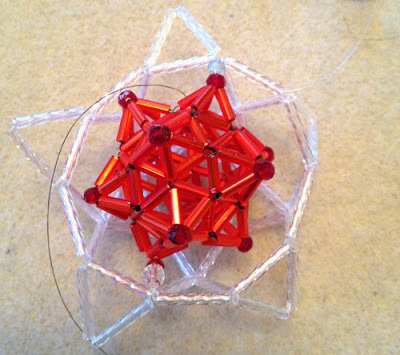 So, I made another smaller bauble in bright red so it would be visible from inside its cage of white. Once the red icosidodecahedran (try saying that three times fast!) 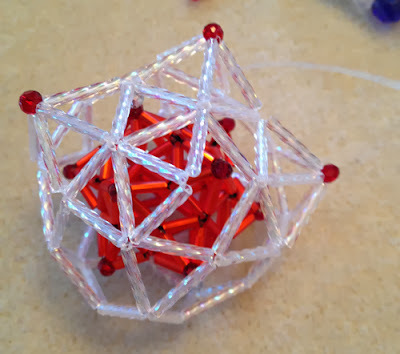 was complete, I had to figure out how to suspend it inside the larger sphere. 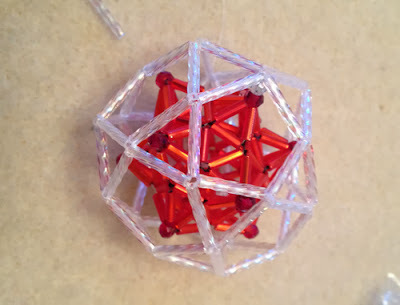 I used smoke Fireline for the red sphere, and crystal Fireline for the outer sphere, and attached the two using the cyrstal thread. 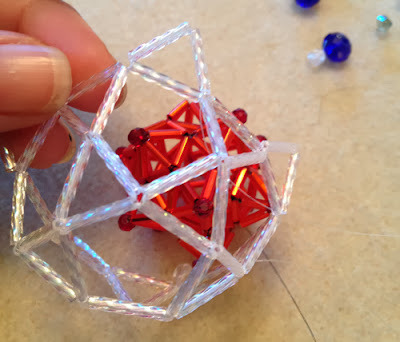 Finishing the crystal sphere - like building Superman's spaceship! the stacked ornament, hanging on my tree! This one is MINE! Here's wishing everyone the very best of New Years! Thanks for your time, your attention, and your caring. And here’s to you reaching your goals in 2014.
wow - you are just endless with possibilities and design! fantastic ideas for Christmas ornaments! !